This is old version Bloons TD Battles 3.7.1 apk for Android, you can install it if you want to downgrade or install old app. It is top Strategy apps from ninja kiwi. Assault Mode will bring powerful defense for your tower and send many of your bloons directly for combat purpose against your opponent. Defensive Mode will save up your overall income and defeat your opponent in a battle of endurance with the superior defense of yours. Monkey Tower Boost is a new mode which enables your monkey to charge its way toward the opponent in limited time. Bloons Boost, on the other hand, supports your bloons when you plan to use Assault Mode. 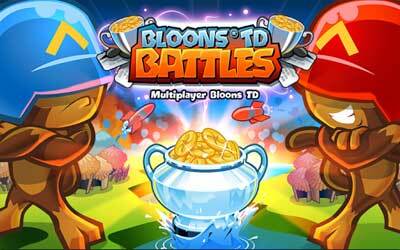 Bloons TD Battles has more features you can get. You can customize the bloons with creative, one-of-a-kind decal in order to add variation to your victory stamp. Because of the nature of the game, this game is designated for multiplayer battle. You can challenge your friends online or from another social network. With 16 achievements to unlock, you can battle your way to discover and solve the challenges of this game. Bloons TD Battles for Android will bring the challenge of defending your tower base to the next level, all with the touch of ridiculousness and cuteness. Make room in your decks, Card Battles is about to get even more interesting with Expansion Set 1 – Veteran Cards. Each week you’ll have the opportunity to earn exclusive new cards just by playing the game.